Clyde attended Addy Grade School, followed by Jenkins High School in Chewelah. 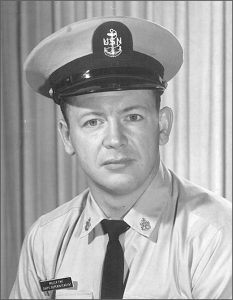 He enlisted in the U.S. Navy at 17 years of age in 1955 along with his older brother, Frank and spoke often of their camaraderie. Clyde served his country for 21 years. He retired in 1975 as an E8 Senior Chief. Clyde was the epitome of what it is to be a proud American. During his early years in the military, Clyde married the love of his life, Nancy Dashiell. Together they raised three daughters, Kim, Linnea and Tamara. Clyde’s Naval duties took his family from Chicago, IL to Bremerton, WA, San Diego, CA and Virginia Beach, VA. While in San Diego, he enrolled in night school and earned his high school diploma in 1969. Prior to retiring from the Navy, he continued his education at Tidewater Community College in Virginia, earning a two-year AAS degree. Upon Clyde’s retirement, he and Nancy decided to return to Chewelah to finish raising their family. He initially opened a mechanic shop in Addy, then was employed at a tire shop in Chewelah for a short time. Clyde was then hired at Lane Mountain Silica as the company’s electrician, retiring after 24 years of employment. During the time Clyde was employed at Lane Mountain, he and Nancy also informally adopted one son, Joey. Clyde had a vision of opening a coffee business in the late 90s. He convinced Nancy to embark on this adventure and in 1999 they opened Dad’s Espresso. Together they worked to make the business flourish, enjoying serving the community and spending time with their employees, most of which have become as close as family. Clyde lived a full life. He was an avid hunter and finished off his hunting career by bagging a bull moose one week prior to his death. This occurred thanks to his great-grandson securing a special permit from WDFW and the efforts of many friends and family. He was a huge fan of many sports, but especially those in which his grandchildren participated. Baseball was a favorite. He was extremely talented, which was evident in his oil and acrylic paintings and his metal artwork. He was a giving man and thoroughly enjoyed sharing his creations with family and friends. Throughout the years you could find him donating his time and talent to numerous programs: he coached youth baseball and Little League; he bought, refurbished and donated bicycles to the school to be given to needy youth; he made and donated metal artwork to venues such as the Rocky Mountain Elk Foundation and Chewelah Chamber of Commerce; he made MVP trophies for the Chewelah Little League Mike Carpenter Memorial Tournament; he served on the Chewelah Rural Ambulance Board of Directors for many years; he harvested, mounted and donated the current cougar mascot that adorns the entrance to the Pein-Lynch Gym at Jenkins Jr./Sr. High School; and he took it upon himself to mow the grass along the west side of Highway 395 on the south end of Chewelah for many years. The list goes on and on. He LOVED to give. Clyde was preceded in death by his parents, John and Ida Miller, and by three brothers, Frank, Leo, and Wayne, and by five of his six half-siblings. He is survived by his wife of 59 years, Nancy; daughters, Kim (Mike) Manus of Newport, WA; Linnea (Steve) Lane of Chewelah, WA; Tamara (Harley) Bowman of Chewelah, WA; son, Joey (Lynette) Coleman of Valley, WA; 11 grandchildren and 31 great-grandchildren; three brothers, Jerry (Betty) Miller, Ron (Alene) Miller, Johnny (Martha) Miller, and sisters Darlene Wooley and Jan Wilde. Clyde’s memorial service will be held at Addy New Life Christian Center at 1:00 p.m. on Saturday, December 22, 2018. In recognition of his military service, full military honors will be presented at Chewelah Memorial Park Cemetery at 11:00 a.m. that same morning. Anyone is welcome to attend the military honors ceremony; however, the family requests that your focus be on attending the 1:00 p.m. service to celebrate Clyde’s life. A luncheon and time to share memories will be held immediately following. In lieu of flowers, please make donations to Chewelah Baseball. Those donations can be mailed to: Tamara Bowman, PO Box 1442, Chewelah, WA 99109.